andLinux is a Linux distro with a difference. It’s based on a port of the the Linux kernel to Windows coupled with an X server and other software. In short, it allows you to run Linux software seamlessly on the Windows desktop without recompiling it or using a virtual machine. For this overview, I choose the minimal/Xfce edition which comes in the form of a 200MB Windows .exe file. 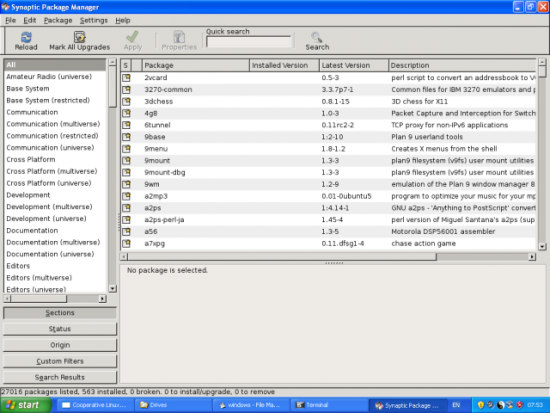 The kernel used is from the coLinux project. Apart from that, the bulk of the rest of the system consists of Ubuntu 9.04 coupled with the Xming X server and the PulseAudio audio system. File access is split into three parts: the root partition is stored in a .vdi file and files on the Windows partition can be accessed via either the coLinux filesystem or the Samba file sharing system. Make sure that filesharing is enabled on the Windows machine if you want to use it, by default, it isn't. The installation contains a quite a few options, but I found that I was able to accept all of the defaults. Installation complete, I was keen to start experiment with this strange system. During the setup, I had chosen to launch Linux applications by using the small icon in the control panel area of the Windows task bar. By default, this contains icons to launch only the file manager (Thunar), the PulseAudio sound mixer, a terminal, a text editor and the Synaptic package manager. These applications load up remarkable quickly, and their execution speed is excellent. It should be, as they are not running through any layer of emulation or virtualization; they are running natively on the Windows desktop thanks to the X server and the Linux kernel. It's a weird feeling, using Synaptic on the Windows XP desktop. It ran very well. It was a slightly surreal experience to watch package management front end Synaptic popping onto the Windows desktop. In operation it worked just like it would on any other Linux distribution. One problem that you’ll run into here is that, as this version of andLinux is based on Ubuntu 9.04, the old Canonical repository is no longer active. However, this problem can be overcome, to an extent, by altering /etc/apt/sources.list to point it to the old release repository [see this forum post]. A full update using the latest package versions in that repository worked as expected. 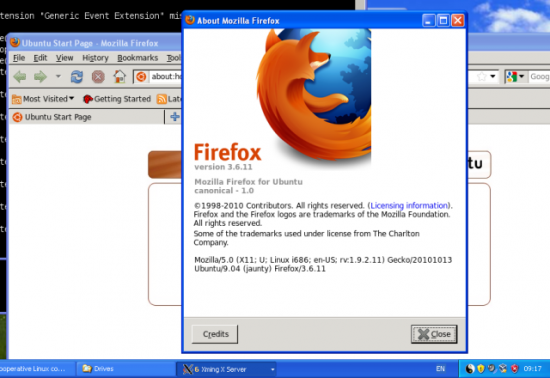 Firefox 3.6, built for Ubuntu 9.04 running on Windows XP. It's difficult to explain to non-geeks what's cool about that. You can run almost any native Linux software seamlessly in this way. Even fairly big applications such as Firefox work perfectly. You can also build from source code using standard tools. So, what are the limitations? The website warns that andLinux might not be the ideal platform for security sensitive applications due to the way in which it is implemented. The site also suggests that OpenGL games and applications may not work very well. As everything runs within a single Windows process, Linux applications can’t make any use of mutiple CPU cores. The other limitation of andLinux is that it is based on Ubuntu 9.04 and can only run software that can run on that, compounding the potential problems with security. This raises the question of whether andLinux is a fascinating curio or something that can be used for real work. I’d say that, despite its limitations, andLinux is a handy tool. Part of its appeal is that it is so easy to use. Following the quick and simple installation procedure, you have access to Linux applications running on a Windows system, all without any further setting up of any packages and other configuration. Given what I have seen of it in operation, I could wholeheartedly recommend it if it were updated. Perhaps some interest on the forum could help to kick-start the project back to life? I’m genuinely interested to find out why such an excellent piece of software isn’t more widely known and isn’t being enthusiastically updated, particularly as the kernel project (Cooperative Linux) is still under active development. Feel free to chip in with suggestions for applications for andLinux. The website of coLinux, the Microsoft Windows port of the Linux kernel.